Back by popular demand... a painting class with local artist April Howland. Howland’s work features wildlife and pets in bold, gorgeous color. This four-week long course begins with a tour of Southwest Wildlife Conservation Center to introduce you to our gorgeous wildlife models—bears, mountain lions, bobcats, coyotes, foxes and more. Subsequent weeks will allow you to sit at the animal enclosures as long as you like to draw or paint from real life. Howland will offer activities and coaching as you work on your pieces. Bring your own art supplies and easels. Sit and relax and become one with your art. All skill levels welcome. Pencil, Watercolor, acrylic and oils are all welcome. 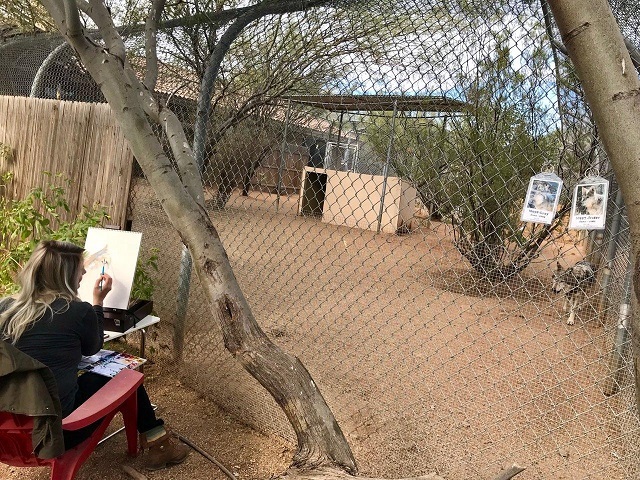 Artists are encourage to work several pieces over the course of each class time as animals are free to roam their cages and cannot be counted on to pose for too long! April’s works have been in a number of juried shows. She has been a guest artist in various galleries and is now represented by Beals & Co in Santa Fe and Coco Milano’s in Mesa, AZ. 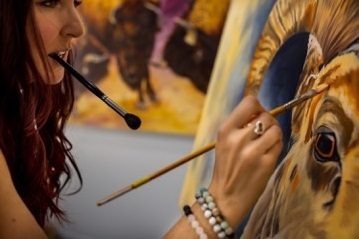 April has been featured in a variety of publications and television news programs for her artwork which include Phoenix People, The Barking Beast San Diego, Scottsdale’s Foothills Focus, The Arizona Republic, PBS Horizon Arizona, and many local NBC, FOX and ABC news programs. April has many collectors both national and abroad. She resides in Phoenix, Arizona with her husband Glen, her son, and a small group of rescue animals. Howland Studios on Facebook, Instagram and Twitter.